Maybe you ride a Screamin' Eagle so tricked out your friends call it a garbage barge. Or maybe your sled is a box-stock 1947 pan that started out in your garage as a basket case. Or maybe you're still eatin' beans and rice so one day you can afford that dream scoot. You're a biker, so you understand. No need for explanations. It's in your blood, in your heart, in your spirit. These are just some of the tales from the countless stories of your brothers and sisters. Stories of the road less travelled. Stories of love, adventure, humor, sadness, and all the other stuff life throws at us. But nothing will ever extinguish that fire inside you, It's who you are, how you act, the code you live by. Now it's time to ride. No excuses. If you can't saddle up right now then pop a cold one and throttle through these pages. It's the next best thing to cuttin' concrete. Seeking to mend a broken heart, Charity hits the road on her old Indian motorcycle, hoping that time and distance will bring healing. Along the way she befriends a timber wolf who shares the lonely ride in her sidehack. When at last she finds a peaceful mountain town she believes her gypsy ways are over. But then two vicious killers appear and threaten everything she holds dear. 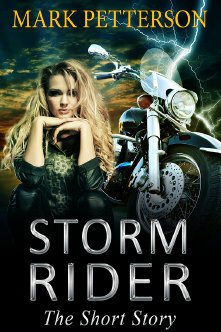 This short story is approximately 7900 words and appears in the book "Storm Rider: Where The Road Leads". When a former medic heads for the open road to try and mend his broken spirit, he rides right into the middle of a violent murder. As the only eyewitness his testimony is crucial to bringing the killer to justice. Unfortunately, the slayer teams up with corrupt cops who plan to kill not only the biker, but the woman he’s falling in love with. This short story is approximately 7800 words and appears in the book "Storm Rider: Where The Road Leads".